Technically there's nothing really wrong with the charging cable that came with your smartphone. Except for that long cord you need to constantly wrap, unwrap, and more often than not, detangle. That won't ever happen with the Thinium, though. It trades an annoying a cord for an ultra-thin transforming design that allows it to plug directly into an outlet. 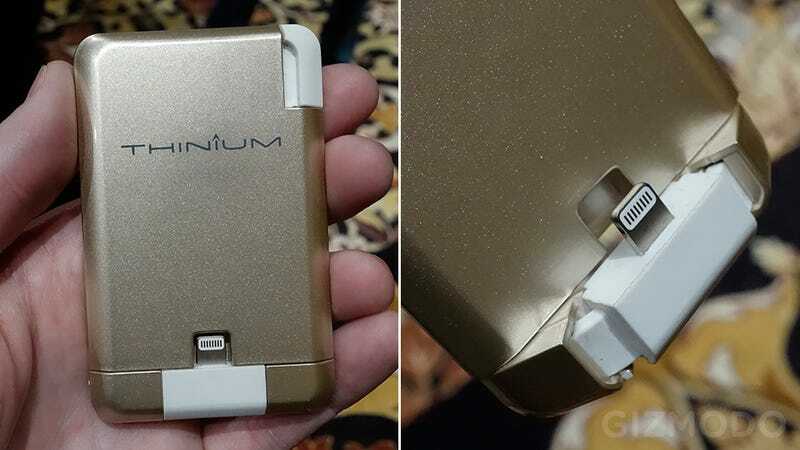 Available soon in an Apple-friendly Lightning connector version for $50, and a microUSB model for $40, the Thinium includes a pair of prongs on the back that pop out and plug directly into an outlet. You'll also notice they remain at a slight angle when extended, that's to ensure your smartphone is leaning back when charging against a wall, miniming the chances of it taking a tumble. And if an outlet isn't available, the Thinium can also leech power from a USB port. But most importantly: yes, it comes in gold to match your goldpagne iPhone.